We also have cuts of lamb available at our market stand or at the farm. We do not ship our meat and our inventory varies by the seasons. Please contact us ross@gravelroadfarm.com 715-281-0813 for more info. 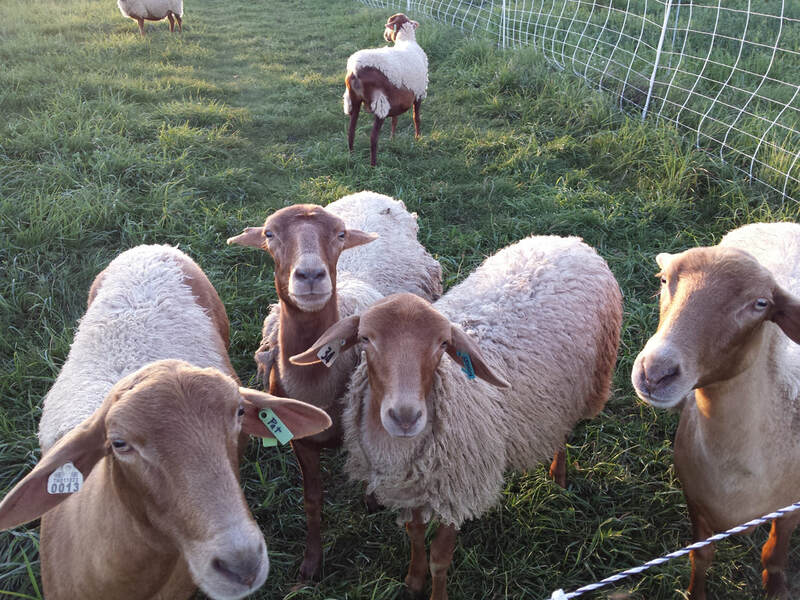 It was August of 2013 when a local farmer out of the blue called us about selling her small flock of specialty sheep. We had always talked about starting out with sheep, and now we had a farm to keep them. But were we really ready? We had never heard of California Red Sheep. I fell in love with their beautiful doe-like faces and darling personalities, and we proceeded to bring them to our farm the next day using our neighbor's trailer and truck. We had just moved to our farm in May of 2013, and were very busy with our vegetable operation, but the chance to welcome such a unique breed of sheep to our farm was hard to pass up. We have currently keep around 20 sheep. They are an unusual breed (likely not many other sheep of this breed in Wisconsin.) The breed is called California Red, a medium sized, gentle sheep, resistant to parasites, with good mothering skills, and heat and cold tolerant. It is a combination of hair sheep (Barbados) and wool sheep (Tunis). They are a naturally polled breed, which means they are born without horns, with red hair on their faces and legs, and beautiful cream colored wool with flecks of red and grey. They are born dark red brown, and grow their cream colored wool as they get older. They are good mothers with rich milk, and very docile, although their personalities vary. The wool is great for hand-spinning, of medium weight and softness. They are good for both meat and fiber, the small scale farmer's dream come true. We bought some chickens, and their coop and fencing and supplies from the same farm at the same time with a plan to follow behind the sheep doing rotational grazing. They work up the manure the sheep have left, and scratch up the top of the soil, and of course eat the greenery, and bugs. Sheep eat grass, simply, we don’t have to feed them anything else. We buy local grain that we tempt them with when we need to move them from place to place. Grain is like candy to sheep, best kept at a minimum. We also give them a small amount of minerals each day. The minerals are important, since the pastures had been neglected and are likely missing nutrients, and the sheep are always eager for them. When the sheep are pregnant and lactating, they need more hay, more water, more minerals. We grow our own hay, (a neighbor has been baling it for us) so we know that it is good quality mix of grass and alfalfa. We bring them fresh water every day. We move them around the pastures using portable electric fencing, which mostly does the job of keeping them in. The first few times they escaped, it was like an exciting adventure. The 50th time, surprisingly, not as fun. We installed a permanent fence in 2014 that keeps our troubles to a minimum. We have to trim their hooves, which can be okay in the winter when the ground is snow covered, but not very pleasant in the spring when things are muddy. When the ewes are lambing, we patiently wait for the lambs to arrive, watching, waiting. When they do come, there is much celebration! We have the sheep sheared in May. We take the wool to a small woolen mill in Appleton on the river called Courtney Woolen Mills. I highly recommend taking your wool there to be cleaned and carded. We have the cleaned carded wool for sale in our online store. Our customers buy it to do felting, spinning, as quilt batting, and making crafts. We also sell our wool at our winter farmers markets. Raw fleeces are also available in the spring. Call or text for more information.